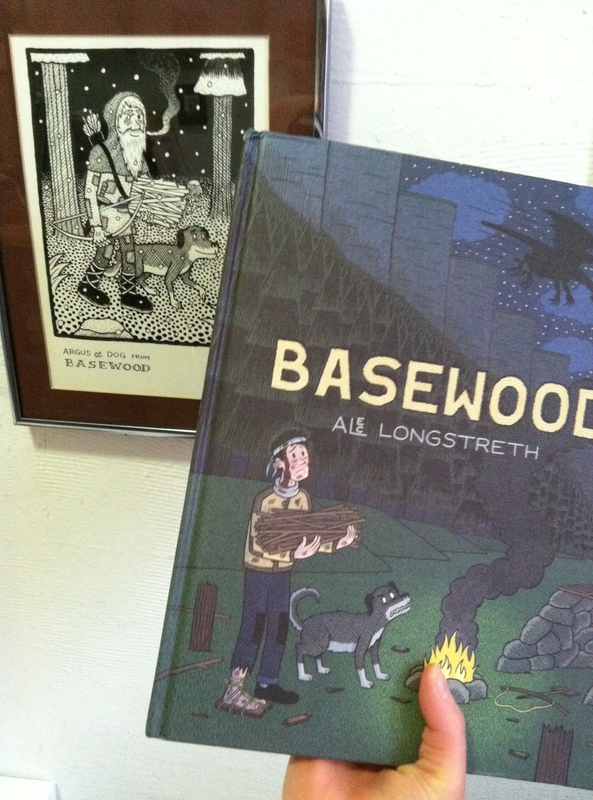 Here is my brand-new copy of Basewood, next to my framed, original Alec Longstreth art. Needless to say, I’m a friend and a fan. I’m partial, so this is a partial review. Still, you can trust me when I tell you this book is GORGEOUS. As a publisher, Alec knocked this out of the park. From its generous size (about 8″ x 11″), to the texture of its hardcover, to the debossing on the title (more on that later), this book looks as good as anything coming out of the major graphic novel publishers. Part of this praise should go to l’employé du Moi, the Belgian publisher/collective who published the French edition back in 2012. They did such a nice job that Alec tried to replicate their design. I “ordered” this book by pledging on Kickstarter, something I do rarely. But I knew I could trust Alec to deliver the goods, and the book arrived just on time. It really rankles me when a Kickstarter reward arrives long after the book is available in stores. In those cases, all you can do is look at that bookstore copy longingly, thinking, “someday my copy will come,” while feeling like a chump. An added bonus to “ordering” via Kickstarter was being privy to Alec’s Project Reports (27 of them to date!). Through these updates Alec meticulously records his publishing process, which utilized a printer in Singapore. I’ve never had something printed overseas, so the Project Updates offered a valuable how-to. I hope Alec collects these process notes into a zine, because it’s handy info. The price for the book is a tad low, just $19.99. I’d expect something like $25+ for a high quality hardcover that’s slightly over-sized. But I’m sure Alec did his homework and can afford to sell it at this price. This entry was posted in Uncategorized and tagged Alec Longstreth, Basewood, haul, review. Bookmark the permalink.